Take the stress out of finding fonts that match together with a set that already does, and focus on what you want to do, which is designing beautiful work. • Money Penny Script – A hand written brush script, first drawn on paper and then remastered on the computer to give a smooth, free-flowing brush script, that looks perfect over the top of photos or as a classy logo. 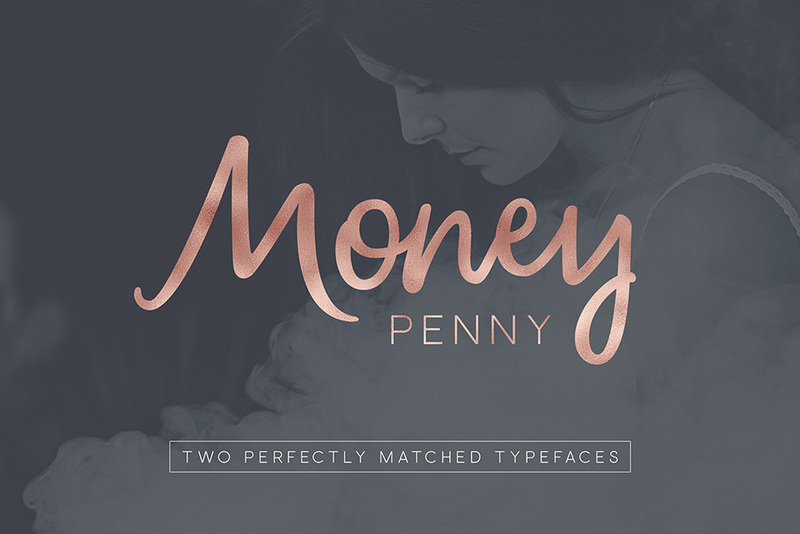 • Money Penny Sans – A super clean, simple and elegant sans-serif font that works either as producing stand alone sophisticated typographical pieces, or in combination with the script font. File size is approx 110.8MB (138.3MB unzipped), offered as a single download. Thanks so much for taking the time to leave us a comment! We would love to be able to include more Cyrillic fonts, and rest assured, our Product Team are always on the lookout for more high quality fonts so I hope that we can include more of these in future for you. If you find any cyrillic fonts that you would like to see included in a future release Gunita, please let us know and we will definitely check them out :). HI, guys, can you tell me what bundle was this font a part of, I need to redownload my files and can’t seem to find it manually, maybe I missed it. Thanks. Thank you so much for your comment and I’m so sorry for any inconvenience caused trying to re-download your resources. Can we expect a webfont of Money Penny in the very near future? This would be great for a project that I’m working on, but would need it in the next couple of weeks. Thank you for your comment! I’m really sorry to be the bearer of bad news on this one but I’m afraid we will not be featuring the webfont version of this font and only the desktop files are available with this item. My sincerest apologies for this inconvenience, Shane but if you have any other queries, please don’t hesitate to let me know. I’m always happy to help! Would love to use this font in a web-project too. As far as the license states we should be allowed to convert to a web-font and use the font in a web-project . Can you confirm that? Thanks for reaching out to Ben on this one! I’m interested in using this for web too, please could you send me a quote for a web font license? Thank you so much for reaching out to us! Rest assured we can certainly find out how much a license like this may cost for you so I have popped you over an email just to get some more information about you particular project so that I can help you further with this!